The newly announced Kordz ONE Series CAT6 RJ45 and CAT6A RJ45 field termination connectors provide integrators a choice of Cat-6 and Cat-6a connectors for use in Ethernet cable termination. Kordz says its new One Series RJ45 CAT6 RJ45 and CAT6A RJ45 products are designed to help dealers terminate Ethernet cables in the field. Kordz, a cable and connectivity product manufacturer known for its selection of HDMI products has introduced new category cable termination solutions. The Kordz One Series CAT6 RJ45 and CAT6A RJ45 products are designed to help integrators easily terminate Ethernet cables in the field. The Australian-based cabling and connectivity company says that its latest products are engineered to provide integrators with a choice of reliable, well-designed products. "Our field termination connectors—available in both CAT 6 and CAT 6a Ethernet categories—have been precision engineered to ensure that the connection simply works," says James Chen, managing director, Kordz. "We know what a tough job installers have, so the last thing they need is connectivity issues arising from poor cabling and connectors. 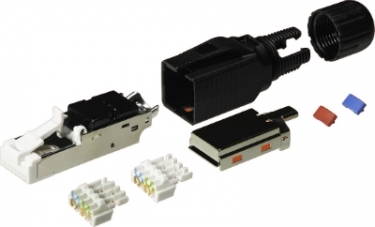 Even with something as small as an RJ45 plug, it's important that these are designed and manufactured correctly, otherwise the connection will inevitably affect the signal integrity. With total reliability from Kordz, it's one thing less for installers to worry about." According to the company, the ONE-RJ45 CAT 6 push-through site termination connectors work with solid and stranded cable eight-pins (gold plated) and eight connectors. The large cable openings are designed to reduce the distance between the wires and contacts to help optimize performance and reliability. Moreover, the Kordz Pass Through CAT 6 is designed for easy termination. Helping to make that process fast is the ability of the conductors to easily pass through the RJ45 connector to allow integrators to verify the wire sequence, says Kordz. The ONE-RJ45 CAT6A version complies with ISO/IEC 11801 2.2 edition Category 6a and ANTSI/TIA-568-C.2 Category 6A standards. Engineered for applications up to 10GBaseT Ethernet, the connectors are said to more than exceed the industry standard of 500Hz. In addition, Kordz offers fully shielded brass nickel-plated base, bronze, nickel-plated covers, and gold-plated phosphor bronze contact pins compatible with cable diameters ranging from 6- 8.5mm, with strain relief provided by a compression nut on the back of the connector.